>> Our BlogUncategorizedBURNT GOLDS HEAT UP THIS SPRING! BURNT GOLDS HEAT UP THIS SPRING! The weather is getting warmer and your color scheme is about to heat up, too! We polled, and you voted – Crack Willow, this chic burnt-gold, is named the Spring 2015 Seasonal Paint Color! McCormick Paints’ Seasonal Color Poll for Spring 2015 opened for voting in March, and website visitors were asked to select their favorite spring paint color based on the four choices selected by designer, Halle von Kessler, owner of 8 Boxwood Lane, a Baltimore-based interior design firm. The Seasonal Color Poll highlights four paint colors from the McCormick Paints Color Is collection, an array of 1320 colors, and is an interactive way to get acquainted with some of the most popular color choices on a seasonal basis. The poll closed last week on May 7, 2015 and we’re excited to announce the voting results! Crack Willow won the poll with the highest percentage of votes at 34.9%. The color gold is associated with luxury, wealth, success and winning (go for the gold!) making Crack Willow fitting as the winner of the Spring Seasonal Color Poll. Described as a burnt gold, Halle considers Crack Willow a “very fashion forward” color. As Halle noted, “Burnt golds and bronzes are showing up all over in plumbing fixtures and hardware, but we are also loving it on wall trims and painted furniture.” Simply put, burnt golds are a hot choice if you’re looking to incorporate style, confidence and class into your home or décor this year. 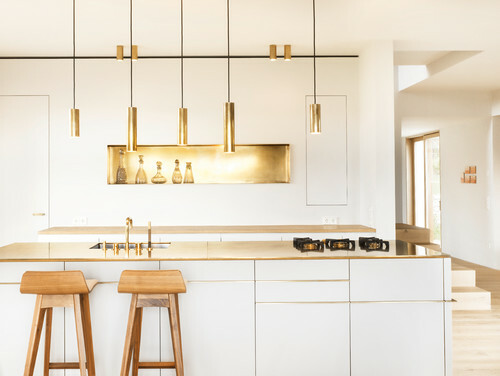 Gold light fixtures and hardware shown in this kitchen from Houzz.com. Crack Willow is subtle enough that it won’t overpower a room, yet bold enough to make a statement as an accent wall or painted furniture, as Halle points out. Crack Willow is a unique variation of the color gold, which is naturally associated with prestige and glamor, because it also contains green undertones that help make Crack Willow’s elegance much more organic and understated. The hints of green also make Crack Willow a great color choice for anyone looking to bring a sense of the outdoors into the home. Crack Willow is shown as an accent wall in this room. Remember, lighting can bring out different undertones in a paint color, as the green undertones appear in this room. Here, Crack Willow is used on the night stands as accent pieces to contrast the neutral wall color and bedding. Do you want to how Crack Willow looks in your own home or jobsite? Then be sure to visit any of the McCormick Paints locations now through May 30, 2015 for your free quart sample. Each store will be giving away quart samples of the winning paint color, Crack Willow, formulated in our premium REVO Paint + Primer in One (choice of flat or eggshell finish). Limit 1 quart per customer while supplies last.